1907 The theatre opened on 8 October with The Sugar Bowl, a comedy by Madeleine Lucette Ryley. The architect was W G R Sprague who designed the theatre as a pair with the Gielgud Theatre on the adjoining corner of Shaftesbury Avenue. 1913 Tango Teas became a popular pastime. The stalls seats were replaced with tables and chairs where, for the sum of 2/6, people took tea while watching professional tango dancers and dress parades on stage. 1920 Elsie Janis altered the theatre so that the stalls were 'surrounded by a parterre and backed by a luxurious lounge'. A note in the programme for It's All Wrong, described as a 'musical complaint', read 'Miss Janis regrets that her name appears so often in the programme, but she does not wish to shirk any of the responsibilities'. 1930 The Old Vic production of Hamlet transferred to Queen's and John Gielgud gave his first Shaftesbury Avenue performances of the role he made almost his own with Donald Wolfit as a strong Claudius. 1934 Moonlight in Silver, an 'ultra-modern problem play' by Clemence Dane, starred Gertrude Lawrence and Douglas Fairbanks Jnr. This glamorous couple attracted much media attention especially as they were having an affair both on and off stage. 1935 Robert Morley's first play Short Story combined a host of talent in Marie Tempest, Sybil Thorndike, Margaret Rutherford and Rex Harrison. 1937 The Gielgud season of Richard II, The School for Scandal, Three Sisters and The Merchant of Venice brought glittering casts and outstanding performances to the theatre. Those who appeared included Leon Quartermaine, Michael Redgrave, Glen Byam Shaw, Anthony Quayle, Alec Guinness, Peggy Ashcroft and George Devine. 1940 The Queen's was the first West End theatre to be put out of action by enemy bombing on 24 September, bringing to a premature close the highly successful run of Rebecca with Owen Nares, Celia Johnson and Margaret Rutherford. 1959 The theatre reopened on 8 July with John Gielgud's Shakespearean recital Ages of Man. Architects Westwood Sons & Partners reconstructed it at a cost of £250,000, with Sir Hugh Casson acting as consultant on the décor. 1961 Anthony Newley and Leslie Bricusse's thought-provoking musical Stop the World I Want to Get Off, about the value of personal versus career choices, ran for 478 performances before transferring to Broadway. 1966 Noël Coward made his final West End appearance in A Suite in Three Keys. In August and September Laurence Olivier's National Theatre presented their first West End season, including famous productions of The Royal Hunt of the Sun and Othello. 1972 Marlene Dietrich appeared for a short season in cabaret. She had first sung in cabaret at the Queen's in 1964, and her performance can be heard on a live recording. Later in the year Maggie Smith and Robert Stephens appeared in an acclaimed production of Private Lives. 1974 Franco Zeffirelli directed Joan Plowright in a notable production of Saturday, Sunday, Monday by Eduardo de Filippo. 1982 Another Country, Julian Mitchell's story about Guy Burgess's schooldays, starred Rupert Everett and launched Kenneth Branagh's career. Everett was subsequently replaced by Daniel Day Lewis and Colin Firth. 1986 A major revival of Leonard Bernstein's musical about New York, Wonderful Town, won both Olivier and Variety Club Awards. 1990 Two sisters, Vanessa and Lynn Redgrave, and their niece Jemma appeared in Three Sisters. It was the first time the sisters had acted on stage together. 1996 Stephen Sondheim's love triangle Passion ran for 232 performances and won Maria Friedman an Olivier Award for her role as Fosca. 1999 Maggie Smith 'acted with every muscle' as Miss Shepherd, the smelly, eccentric Lady in the Van, who lived in playwright Alan Bennett's drive for many years. 2004 The RSC gave a short London season of The Taming of the Shrew and The Tamer Tamed prior to Les Misérables, the West End's longest-running musical, moving from the Palace Theatre to its new home at the Queen's. 2010 On 8 October Les Misérables celebrated the 25th anniversary of its original opening at the Barbican Centre in 1985. 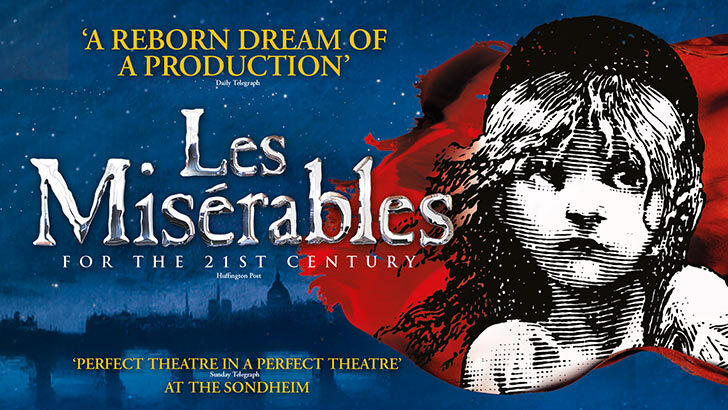 2012 1 June marked the 11,000th performance of Les Misérables in London.